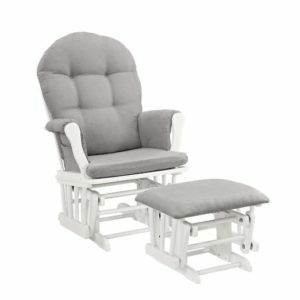 What Space Saving Nursing Chairs are Parents Buying? Whenever you read a web page that tells you the best products to buy – do you ever wonder if anyone actually buys them? Maybe the researcher didn’t get it correct and people don’t agree with the website’s best picks? Well, that’s what we have been wondering ever since we published ‘Top 10 Narrowest Nursery Gliders for Small Spaces‘ in September 2016. 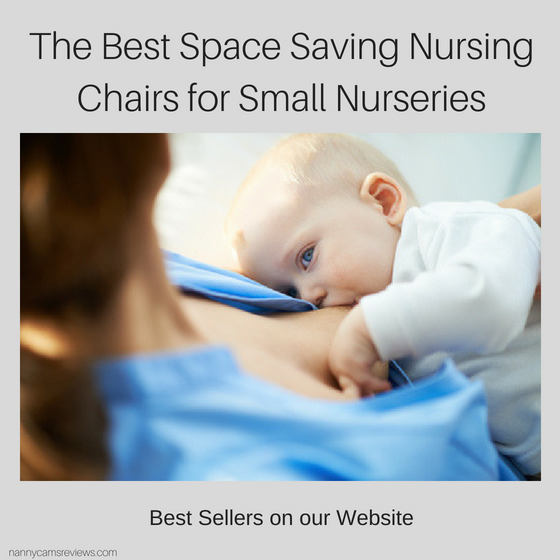 So we thought we would go back through our records and collect together the most popular space saving nursing chairs for small nurseries that our readers actually purchased! Check out the table below and the short descriptions further down this post (these are the nursing chairs our readers actually purchased in order of preference!) and find out whether our readers agreed with our best picks! 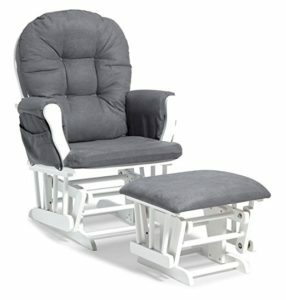 The Windsor Glider and Ottoman was hands-down, the most popular of the space saving nursing chairs from our previous list. With a generous size seat, padded cushions & armrests and a width of just 25.80 inches, this slim nursing glider has a solid wood frame for extra stability. The upholstery is available in a range of different colours and patterns, including grey, green and navy chevrons, beige upholstery with black, cherry or espresso timber, and plenty of other modern and traditional combinations. However, whilst this is the most popular space saving nursing chair purchased, we noticed that after around 3 months of use many parents complained that the chair creaks, cracks or just breaks. They tend to blame these problems on its cheaper price (currently selling at just under $150.00), vowing to spend more money next time! The vast majority of parents however, find that this spcesaving rocking chair is wonderfully comfortable, solid and quiet to use. 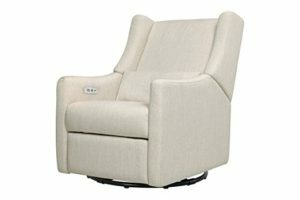 The second most popular space saving nursing chair is the DaVinci Olive Swivel Glider that comes with a bonus ottoman. 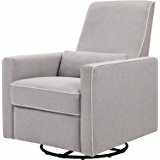 This upholstered swivel glider (360 degree swivel) has a 29″ width, a maximum weight capacity of 300 lbs, a high back with a lumber pillow and is available in cream, light or dark grey. 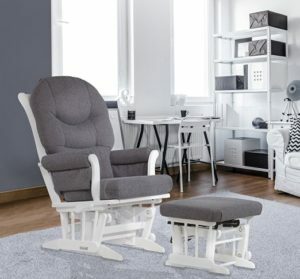 Just about the only negative feedback from parents is that the back seems rather high for short people, other than that problem, everyone finds the DaVinci nursing chair comfortable and great value (currently selling for around $280.00). The Dutailier Sleigh Glider Recliner is another of our small upholstered nursery chairs that are popular with parents. With a maximum width of 27 inches, it’s one of the narrowest and most space saving nursing chairs on the market making it perfect for small nurseries. It is also available in three different colours (dark or light grey and light beige) with thick padded arms & cushions and the cushion covers are machine washable. Handcrafted in Canada and made with a hardwood frame, the Dutailier is a sturdy rocking chair for small nurseries, but it does require some assembly. Any negative feedback concerns the narrowness of the seat, which has taken some parents by surprise! A few have found that the nursing chair was damaged during transit. Generally however, parents find that this narrow rocking chair is wonderfully comfortable and well worth the higher price (it currently sells for just under $500). At just a tiny 26.6 inches wide, the Baby Relax Mikayla Recliner is not quite the the smallest space saving nursery chair on our original list. 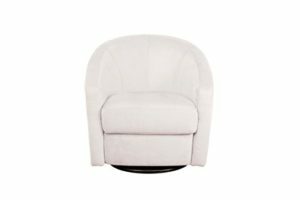 It is available in four colours (beige, grey linen, grey microfiber and mocha microfiber) and has an elegant trim feature and button tufting on the back rest. This nursing chair both swivels and glides and it also reclines as well. Some parents have found that this chair becomes quite squeaky or creaky with long term use and shorter parents have found problems righting the chair once it is reclined. 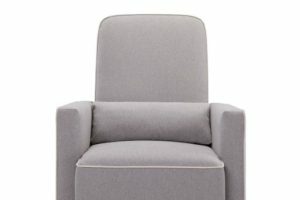 Generally, however, most parents find that this small nursing chair is really comfortable and great value for the price (currently selling at just under $300). The Stork Craft Custom Hoop Nursery Chair is an outlier that wasn’t on our original list. Since the seat cushion is a teeny-tiny 18 inches in width, it isn’t suited to everyone, but the external width of 24.8 inches makes it a great space saving nursery chair for small nurseries. It is available in lots of different colours and patterns and comes with a gliding ottoman as well. Whilst most parents find that this is a really comfortable nursing chair, some have found that it starts to squeak at around three months and looks decidedly worse for wear after a year. One of the best features of this space saving nursery chair is that it is easy to assemble and another is its sturdy design and upright back (perfect for anyone with a sore back). This slim nursing chair is also at a great price point – currently selling at less than $150. The Babyletto Madison Swivel Glider is another left field choice by parents, but there is method in their madness! It appears that parents have chosen this swivel glider for their nursery because they want to be able to re-purpose it elsewhere in their home. Some of course, have bought it for their study or guest rooms and not for their nursery, but many have wanted a small nursery chair that doesn’t take up too much space and have decided that the Babyletto is perfect for them. Available in three colours (Ecru, mocha and slate), the Babyletto is made from water-resistant and stain-resistant micro-suede material with a metal base. It swivels 360 degrees and has a maximum capacity of 300 lbs and the width of the seat is a small 21 inches. Some parents have found that after about a year of use this nursery chair tends to make a clicking noise and the mechanism breaks underneath the chair. The majority however, love how elegant it looks, as well as being comfortable when nursing and the fact that it doesn’t take up much room in the nursery. Currently selling for just under $200, parents say that it’s great value for money. 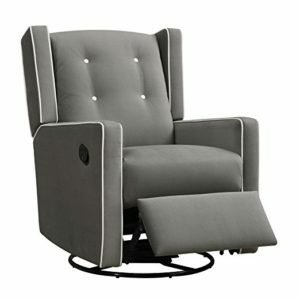 The Babyletto Kiwi Electronic Recliner & Swivel Glider is another space saving nursery chair that came out of left field. It’s width is 28.8 inches, so it’s not the slimmest nursery chair, but this traditional style chair takes relaxation to a whole new level! With hidden electronic buttons, you can recline the back and headrest and lift the footrest up, so that you can find the best position possible to feed your baby. No wonder this is one of the most popular small upholstered nursing chairs with our readers! One negative is that even though it has a USB charging port, there is nowhere to rest your smartphone when it’s charging. However this doesn’t seem to be a big problem, because the majority of customers love this nursing chair – it doesn’t take up much space, supports your head and lumber spine and it’s a piece of cake to assemble. At just under $600, it is expensive, but if you want an electronic slim line nursing chair, this is the most popular one with our readers.